Alopecia is referred to as hair loss or baldness. It is a condition in which you suffer from loss of hair from the scalp and body. This problem is faced by many people throughout the world. Both men and women experience this problem but the intensity and pattern of hair fall differ. Baldness is a word that is generally used to describe male pattern of baldness. This includes partial or total lack of hair on the scalp with limited or no hair growth at all. The symptoms of baldness are receding of hair line, patchy hair loss and thinning crown. It is mainly caused because of the unhealthy lifestyle practices, hormone imbalances, hereditary factors, aging, intake of steroids and other severe forms of medication, pregnancy in women, illnesses, hairstyling, poor health practices, psychological and physiological stress and shock, trichotillomania or compulsive hair pulling disorder and so on. This is a chronic hair problem and it you can treat it with medication, clinical treatments, hair replacement and hair restoration. You can also tackle this issue with natural remedies and by maintaining a healthy diet. What is Mesotherapy Treatment for Hair Growth? Mesotherapy is an alternative treatment for baldness. It helps in curing baldness in both males and females. It reduces hair loss and promotes the growth of hair. It also slows down the male pattern of baldness. Mesotherapy is a process in which the levels of protein, vitamins and other nutrients, and growth factors in the scalp are regulated. This is done by injecting nutrient boosters in the scalp with the help of injection guns. This is done in the least painful way. Nutrient boosters help in keeping the scalp well nourished and hydrated. This process also includes initiating cell metabolism, getting rid of infections and promoting and accelerating hair growth. It also helps in increasing the circulation of blood in the scalp so that the hair follicles are revived and strengthened to help in the growth of dense voluminous, long and healthy hair. This treatment is a faster treatment compared to its counterparts. This is because it helps in restoring hormone balance gradually. It also neutralises the effects of DHT hormone, thereby increasing the growth of new hair strands. In mesotherapy, nutrient rich liquid is injected in the mesoderm of the scalp. Mesoderm is the layer beneath the epidermis and serves as a link between the layer of fat and the issue of the skin. In this process a special mesotherapy gun is used for injecting the nutrients into the scalp. This gun carries a sterile needle and this needle injects the solution in the scalp. This treatment usually includes eight sessions. One is given every week for a duration of half an hour each. When you take this injection, you will get any visible results only after the fifth session. So you should be calm and patient and composed while taking this injection and wait for the result patiently. 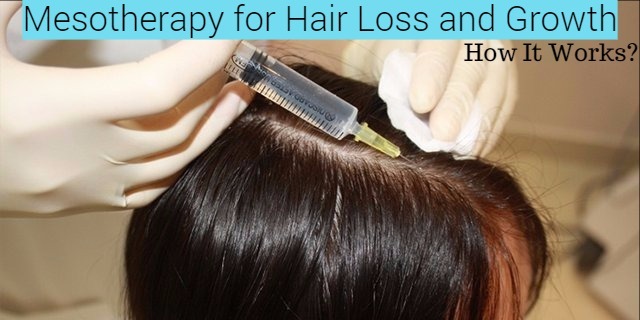 The basis of the treatment substance that is injected during the therapy depends on the cause for hair fall that you experience. This substance generally contains vitamins, nutrients and other materials that are good for the tissue. So, this treatment is considered safe and usually does not have any side effects or allergic reactions. The patients who have this treatment experience no or minimal pain and least discomfort. This makes mesotherapy an easy solution for tackling the problem of balding. However, if you are suffering from any kinds of skin problems, dermal inflammations, diabetes, haemophilia etc, you should not choose this treatment as it can hamper and deteriorate your health condition. Even pregnant women are advised not to opt for this treatment. Other than hair fall and baldness, you can also treat dandruff with mesotherapy. However, you should use this alternative only if you suffer from serious dandruff problems and that too after consulting your dermatologist and determining the cause of the dandruff. Proceed with treatment only if the doctor says you can go on with it. It can minimize the side effects such as allergies and drug interaction. This treatment does not involve the use of anaesthesia. You are ensured of speedy recovery. Generally the treatment is given once a week. When visible improvement is seen then the treatment is given less frequently, like once in a month. This is a 4-month treatment. Mostly the result is observed after the treatment. So you will have to complete the treatment. If you leave it in the middle, you will not get the results you have desired. Mesotherapy Results – What you get from it? This treatment makes your hair more voluminous by increasing hair growth. Prevents excessive and rapid hair shedding. This treatment also encourages the hair follicles to move to the anagen phase. It can make your hair stronger and restore its lost lustre. This treatment can give you good results. So you need not go for hair transplant surgeries and other expensive and painful treatments once you opt for mesotherapy. For best and speedy results, it is important that the patient follow a healthy diet, avoid eating junk foods and toxins, and follow a fitness regime and regular exercise programme.